An unmanned Russian cargo ship parked itself at the International Space Station tonight (July 28), in a second attempt to test an updated space docking system, NASA says. The robotic Russian Progress 47 spacecraft re-docked to the space station to test the new Kurs-NA docking system. The cargo ship safely approached the station and automatically attached itself to the Pirs docking compartment on the Russian segment of the massive orbiting laboratory at 9:01 p.m. EDT (0101 GMT July 29). Russia intends to use the Kurs-NA docking system on future unmanned Progress spacecraft and manned Soyuz vehicles. The Progress' safe docking followed a failed first attempt four days ago, on July 23, which was aborted after a technical glitch prevented the spacecraft from reaching the orbiting outpost. 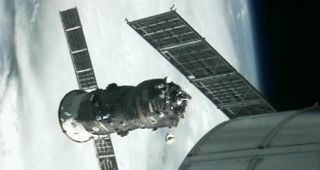 After that attempt, the Progress 47's onboard computers kept the craft a safe distance away from the station while Russian engineers analyzed the failure. Today's successful maneuver was a key demonstration of the new Kurs-NA docking system, which is an updated version of the Kurs system that has been integrated into Russian spacecraft for years. Engineers made several upgrades to the newer version, including better electronics that are expected to use less power and improve safety. The Progress 47 docking test occurred a day after a different unmanned cargo freighter arrived at the space station. The Japanese H-II Transfer Vehicle-3, or HTV-3, was safely attached to the orbiting outpost Friday morning (July 27). The spacecraft is packed with fresh supplies, food and science experiments for the station. The Progress 47 arrived at the space station in April to deliver clothing, food and other supplies to the astronauts living aboard the space lab. The cargo ship had been attached to the Pirs docking compartment since it first reached the station and completed its prime mission, but was purposefully undocked on July 22 to prepare for the Kurs-NA trial run. After unloading all the cargo inside the Progress 47, the station crew re-loaded the spacecraft with trash and other unwanted items. Russia's disposable Progress vehicles are intentionally sent to burn up during re-entry into Earth's atmosphere at the end of their missions. The Progress 47 cargo ship is scheduled to make its final departure from the space station on July 30 at 2:11 p.m. EDT (1811 GMT). The space station's Expedition 32 crew, led by Russian cosmonaut and station commander Gennady Padalka,monitored today's docking test. There are currently six astronauts living at the orbiting complex, including Padalka, Russian cosmonauts Sergei Revin and Yuri Malenchenko, NASA astronauts Sunita Williams and Joe Acaba, and Japanese astronaut Akihiko Hoshide. The next Russian cargo ship, Progress 48, is slated to launch on Aug. 1 from the BaikonurCosmodrome in Kazakhstan.